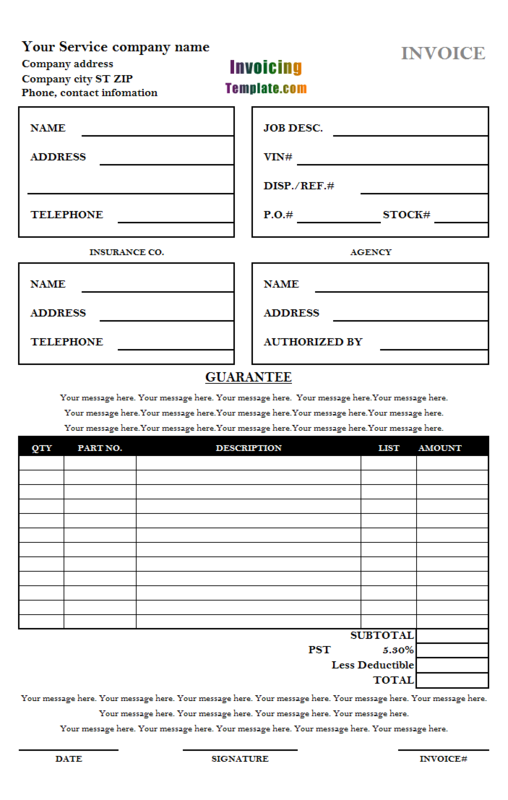 Here are our templates closely related to Invoice Template Non Profit. 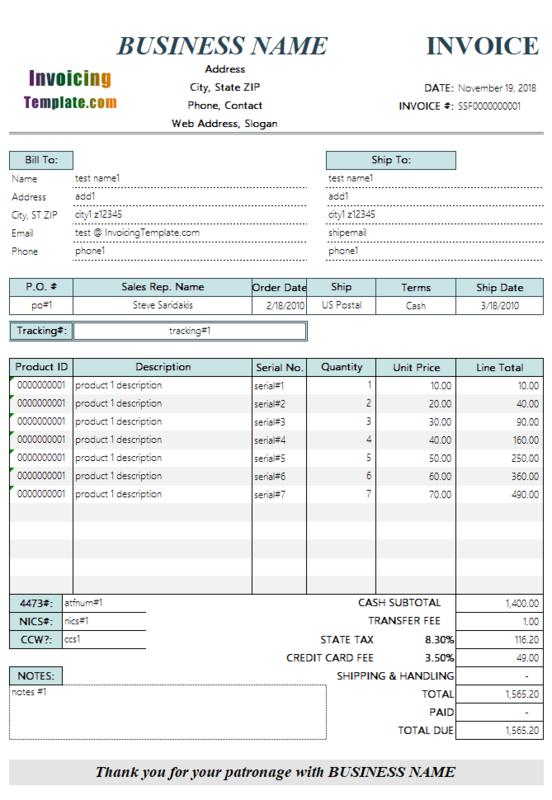 This variant format is created based on the Sales Invoice Template with Profit Calculation, by moving the entire shipping address section out of the print area. 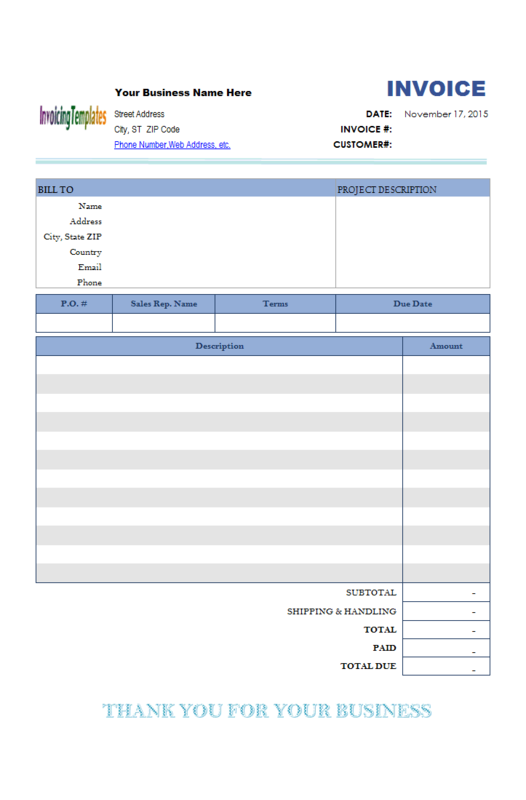 You can download the finished billing template, Sales Invoice with Profit Calculation, from the download page, or download the PDF version by clicking the corresponding link at the right-hand of this page. 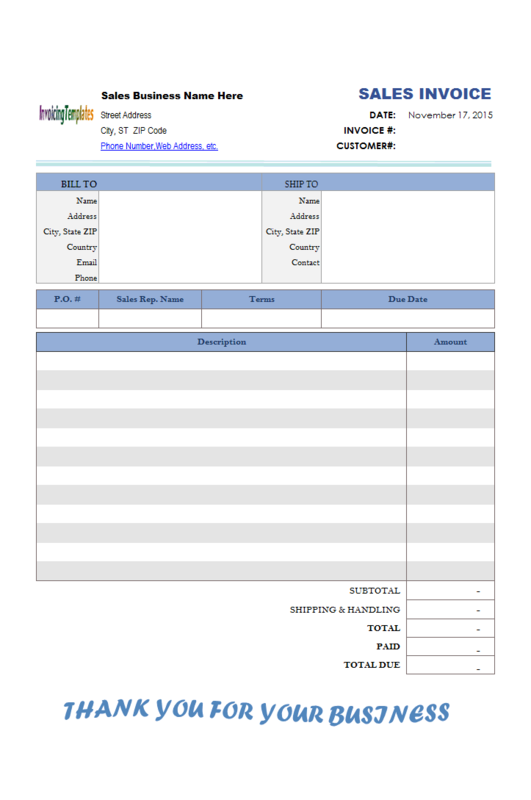 The service version of this template, Service Invoice with Profit Calculation, which does not include the shipping address section, is also provided. 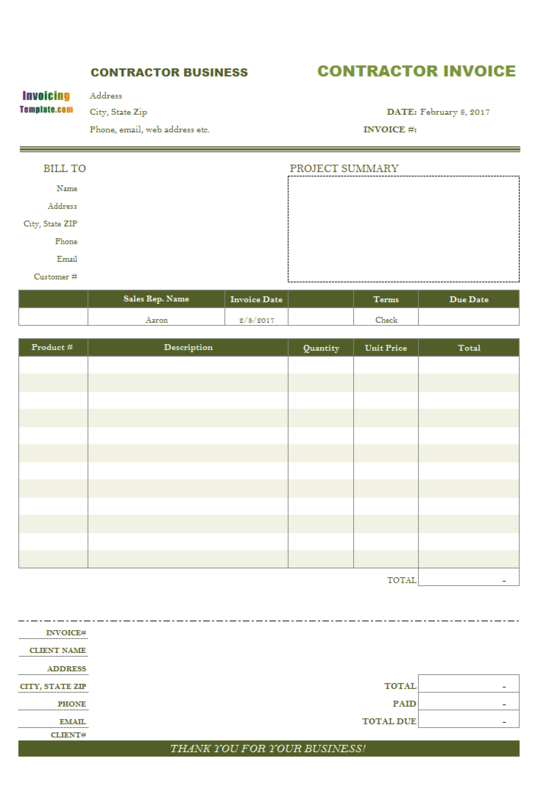 We've also created a variant for each of these templates, Sales Invoice with Profit and Taxable Column, which is a sales invoice template includes the profit calculation, and also adds the "Taxable" column to the printable invoice form; and Service Invoice with Profit and Taxable Column, which is the service edition that includes both profit calculation (outside the printable invoicing form), and the taxable column (inside the printable area). All these designs and forms are providing you for free by InvoicingTemplate.com. 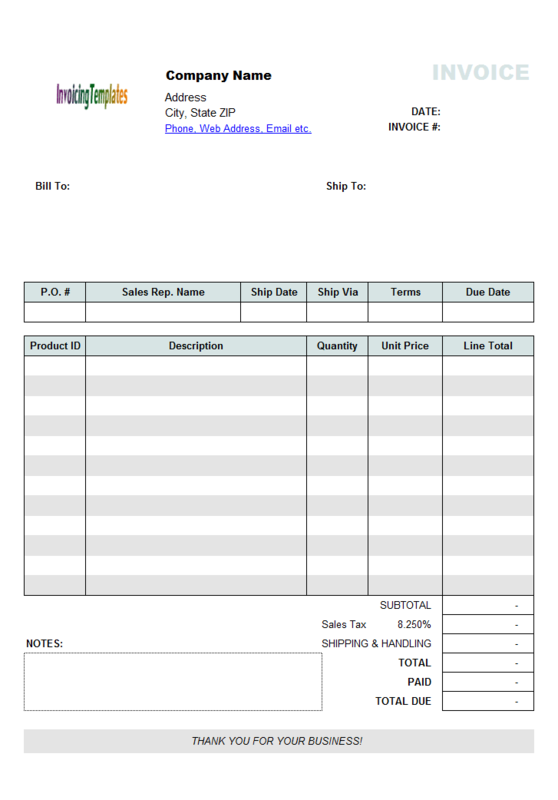 This invoicing template, Sales Invoice with Profit and Taxable Column, adds a printable "Taxable" checkbox column to the default sales invoice template, and a non-printable Profit column outside the print area. 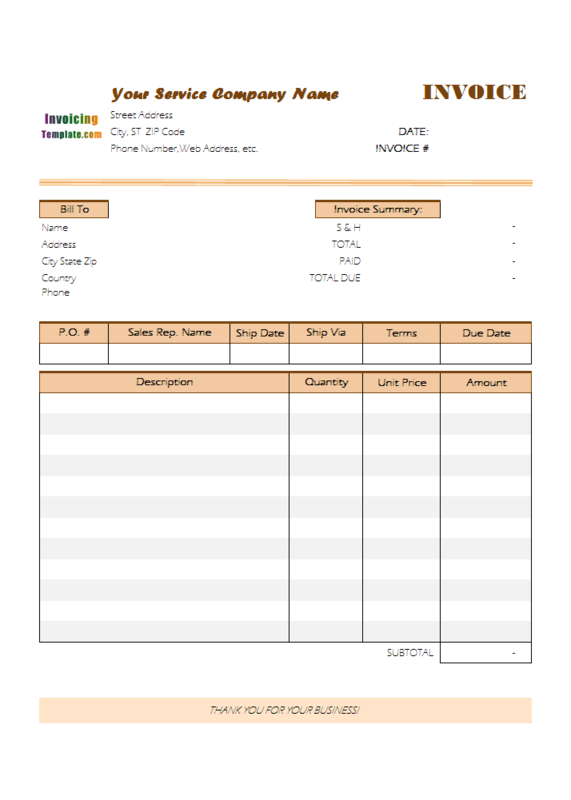 Besides sales invoicing templates and service billing templates, we are also categorized some special templates into receipt templates for creating receipts, pro forma invoicing templates, consulting billing samples and other invoicing templates. Each template has detailed description and format specification. Our ideas is to let you find your desired forms and formats with easy and quick and at no price. If you are a technician and would like to know more about how to customizing the templates, download UIS and look into the electronic book come with the installer program. With UIS, you can not only create beautiful and professional invoices, estimates orders, but also manage inventory, payments, invoices and customers with a few simple mouse clicks. 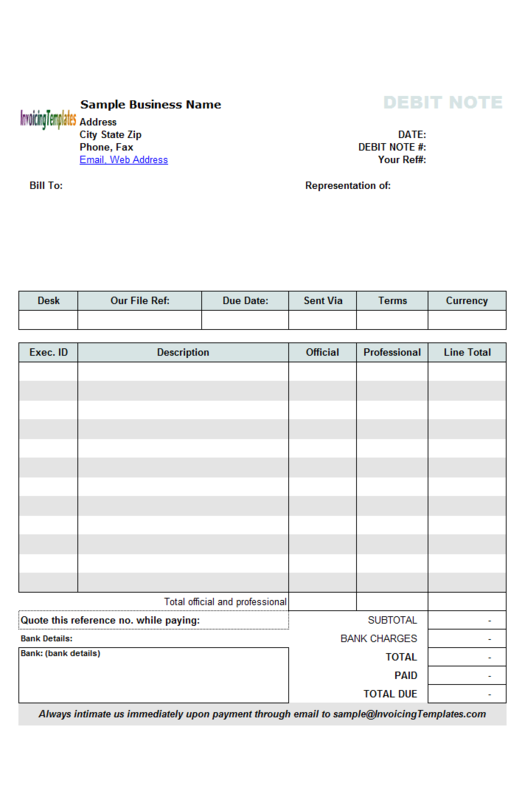 If you are offering service, such as plumbing or a handyman, or renting trucks, you may find this service billing template handy. How do I define a name for an Excel shape / object? 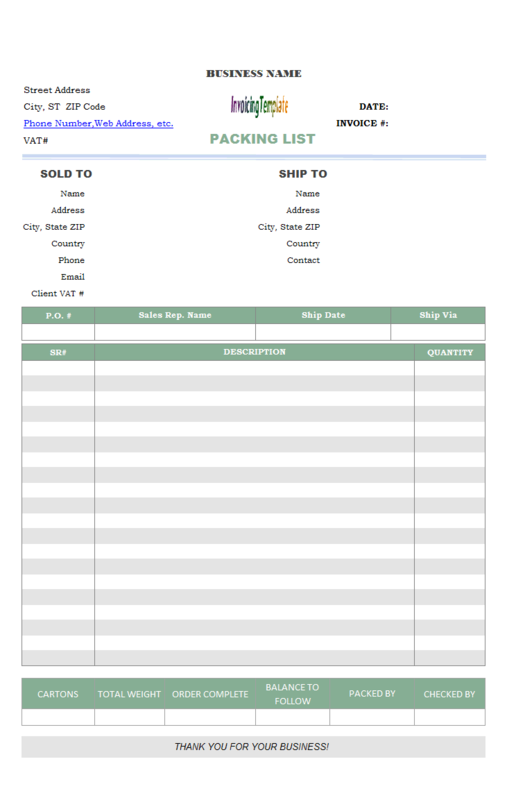 Blank Sales Format (No-tax) is a free sales invoicing template that includes a shipping / delivery address section, two editable columns (description and amount). This sample includes no tax cells. 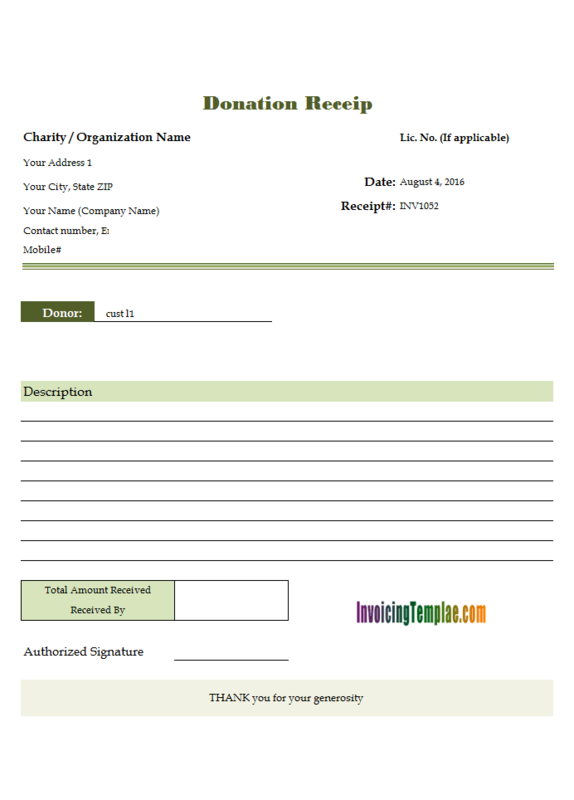 First of all, the most important item to include on the receipts is the name and status of charity / organization name. It must be a non-profit, meaning you have 501c3 status under the federal government. In our donation receipt design, we simply used the fields that are usually for seller information, located on the top of the Excel form. If you have Invoice Manager for Excel (namely Uniform Invoice Software) installed, setting tax types is as easy as clicking several buttons. For example, if you find a template here on InvoicingTemplate.com interesting but don't need tax fields, you can set it to non-tax by firstly clicking the Settings button on the Invoice worksheet, and then go to the Taxes tab of the Settings dialog box. The Taxes tab offers 3 options, non-tax, one-tax and two-tax. Tax names and rates can also be set on the "Taxes" page of the Settings window. On the bottom of the form, there are fields for 4473# (learn more about ATF Form 4473 - Firearms Transaction Record Revisions), NICS#, CCW (Carrying a Concealed Weapon Application and Policy). These are all important fields. 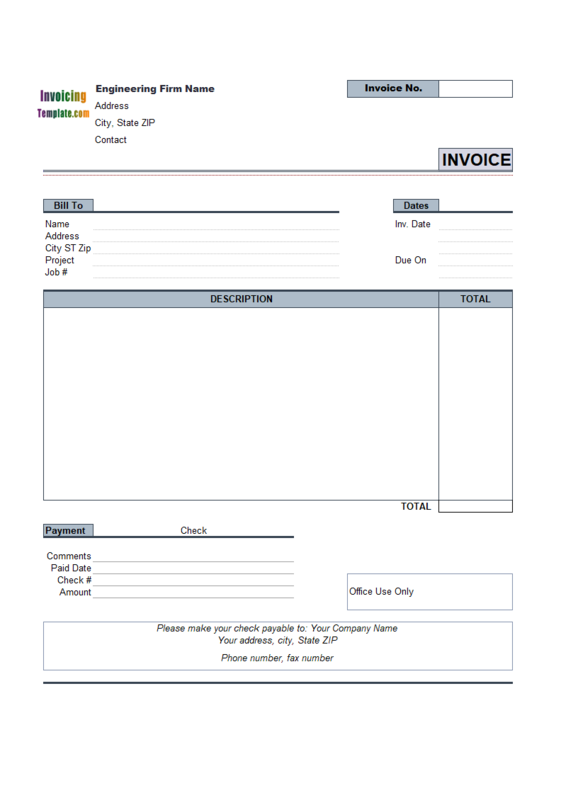 This free contractor invoice template features a remittance slip or remittance-advice-slip on the bottom of the Excel form. 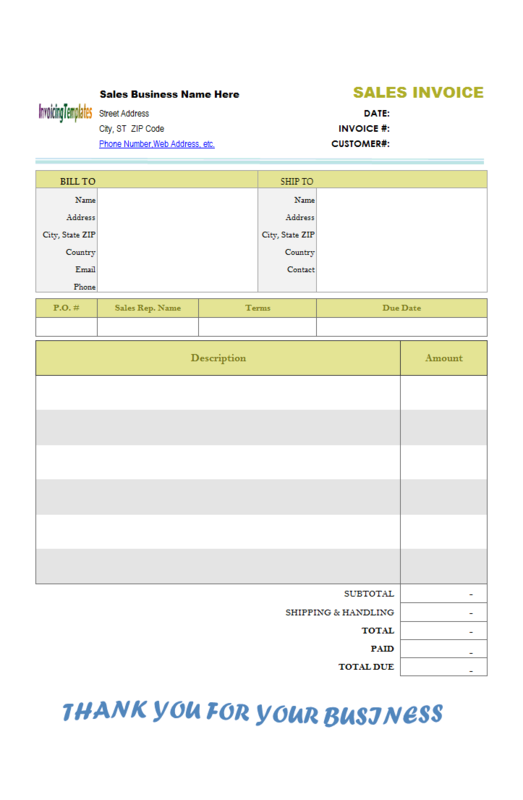 The slip is created by mve the total, paid and total due cell down to the bottom, as well as all the information in the "Bill To" section. To archive this goal, we first have to copy the existing invoice design to create a new form, and then modify the new form to make it suitable for packing lists. 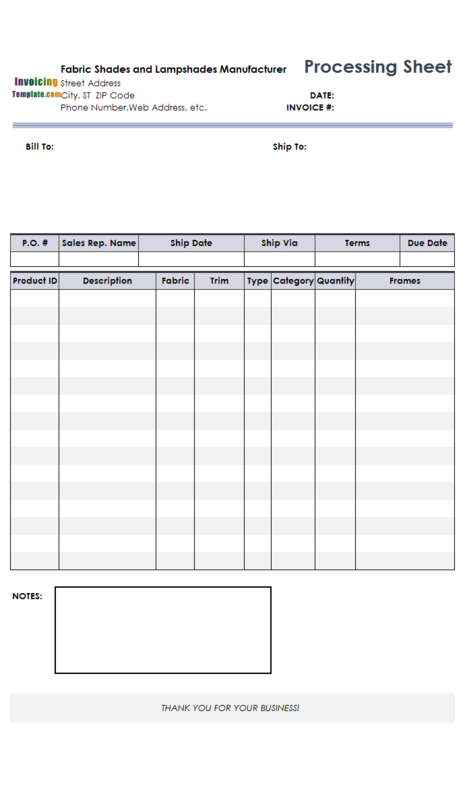 And finally, we modify the definition of the printable form, to have Excel print both documents (the invoice and the packing list) at the same time. For each customer, you can set its price type to one of the following: distributor, wholesale, retail, individual, or special. For each product, you can set 4 prices, distributor, wholesale, retail and individual. 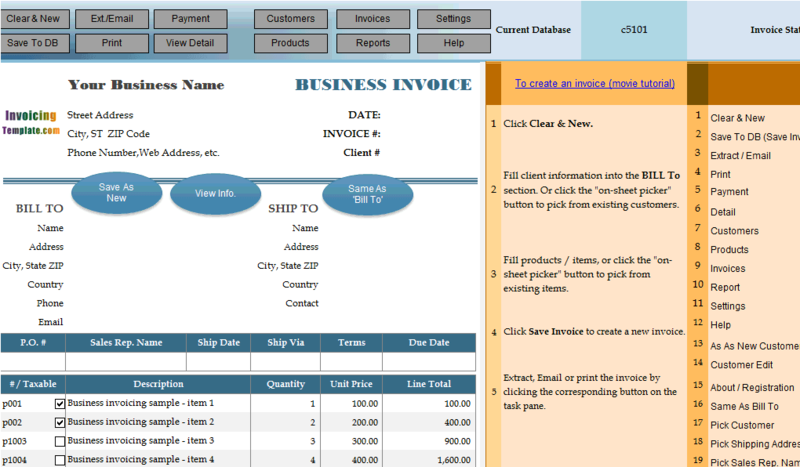 When creating an invoice, the price type is loaded / displayed on the invoice form when you select a customer. 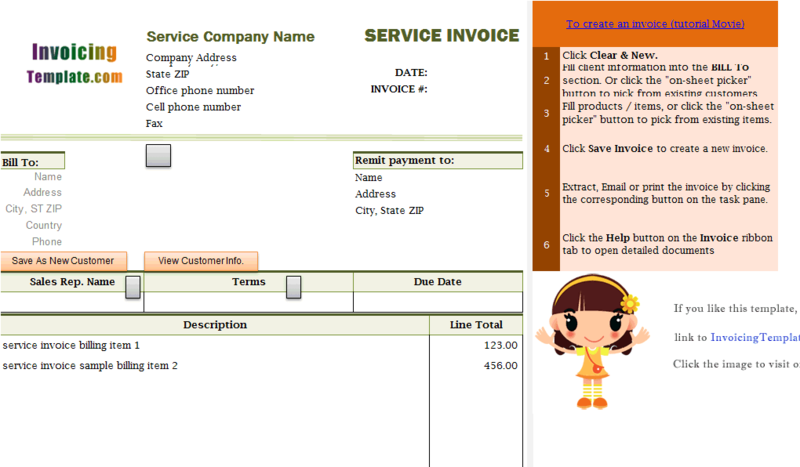 It is allowed to modify the price type of this customer for this invoice. This information is not included in the printed invoices. When selecting a product / service item, by using Excel formulas one of the 4 prices of the current product / service item is chosen according to the customer's price type. If the price level is Special, the invoice template allows you to manually enter a price for the current product or service item. This is necessary if the customer is very special, say an employee of your company. Since this is a service bill sample, it does not include the shipping address fields that could be found on the default template included in Invoice Manager for Excel (namely Uniform Invoice Software) (UIS) installer program. However, the most obvious characteristic of this sample design is that, while at your first glance, it uses a very special font style and size. 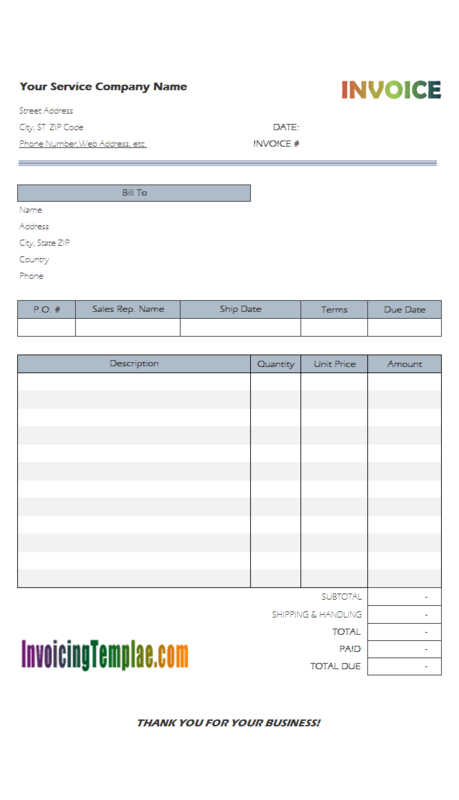 For this reason, this Job Billing Sample was also provided as a sample of customization when it was first published on office-kit.com. 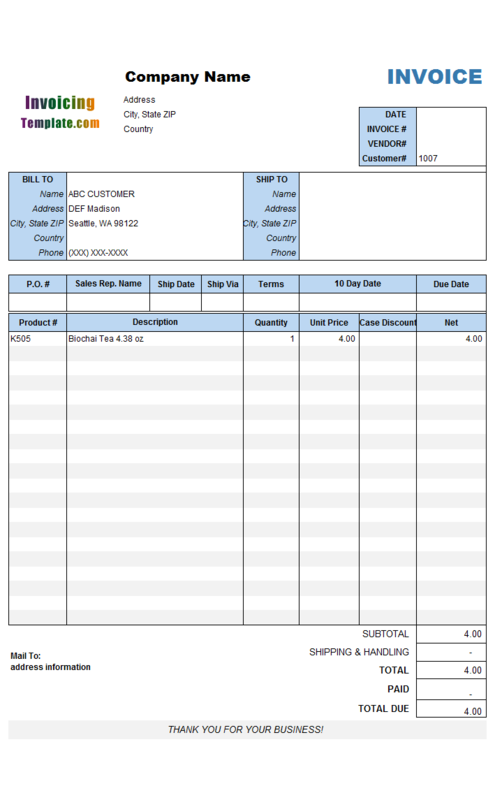 When the invoice is created for the customer, the customer will need to know price, line total etc (but doesn't need to know which parts were used). I.e. 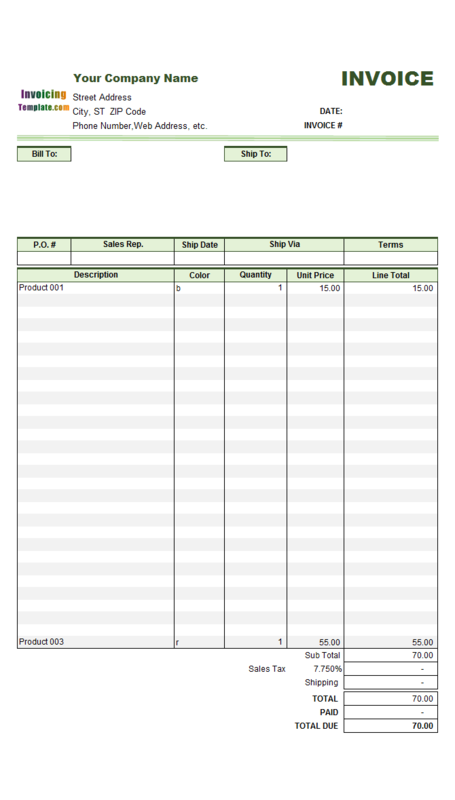 the manufacturer wants to use the processing sheet to provide information to make the shade for the order. 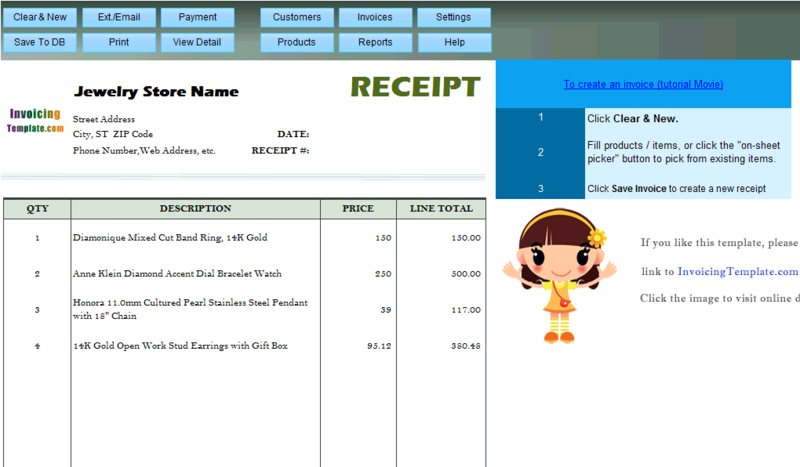 Then, it wants to print the same order as an invoice to send to customer with the billing information on.